Occasionally, when it comes to Summer, the blogging world kind of simmers down. Readership drops, sales decrease, and most people just spend the warm-weather away from their computers doing other fun stuff. I’ve always seen my way through these Summer readership slumps with a steady posting schedule that doesn’t vary much from my typical plan, and have always prided myself on not disappearing. But this summer? This Summer found me taking an unplanned blog break. No, I wasn’t completely gone, but I definitely wasn’t around much… I mean last week I posted 1 post. ONE POST. Who is this blogger? Certainly not me-the person who sits in front of a desk every single day even during the Summer months and continues to pound out post after post. But it was me-and as my posting dwindled through July I promised myself I’d be back at it bigger and better in August… And then August came and it was worse. The amount of time working two jobs increased and the amount of time being able to write, post, and promote my blog plummeted. Let’s not kid ourselves, I’ve always been too busy, but out of all of the things that keep me busy, the blog is the one that I’m most passionate about and most adamant about not dropping the ball on. But drop the ball I did… I was working 60-70 hours a week between my two jobs and just exhausted all of the time. On nights I closed at work I’d get home late and have to get up early the next day, and end up so tired that when I had an evening off I’d just crash because my body desperately needed to catch up on sleep. This brought many a day looking at my blog, blinking, and unable to mentally put what I wanted to write into form. Every time I thought about my blog I’d get anxiety. 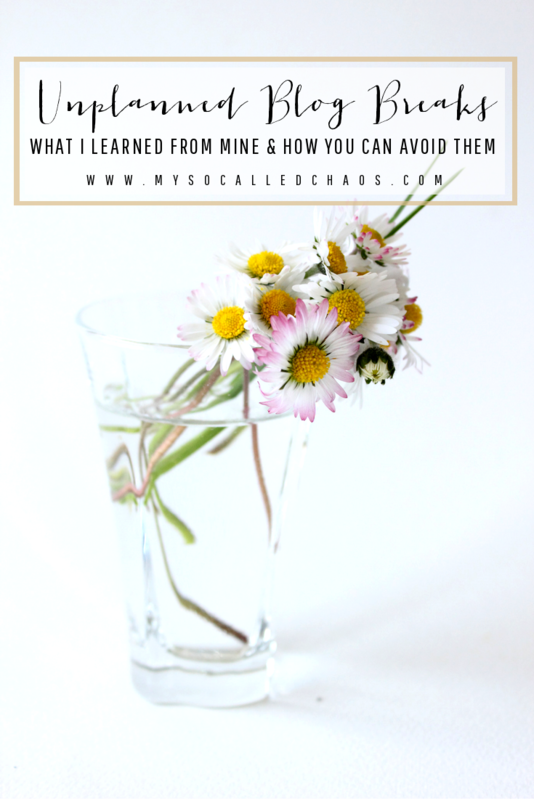 I wasn’t posting as much as I wanted, I hadn’t participated in my blogging group (which I admin) as much as I wanted, and I wasn’t getting around to reading everyone’s posts as much as I wanted. My inbox was overflowing with unread email, my sponsors weren’t getting their fair share of promotion, and there were literally 30+ posts sitting in draft that I hadn’t gotten around to finishing and scheduling. It made me sick to my stomach to think about, because my blog has always been my safe space, passion project, and just my favorite thing. The more anxiety and stress I felt about my blogging issues the less likely I was to blog or work on promotion. I’ve always been the type that if I get too stressed about something I pretend it doesn’t exist until it explodes into a bigger and messier issue I have to then clean up. I’m the worst type of procrastinator, even procrastinating my procrastination, and so it snowballs out of control, and before I can stop it, and my anxiety gets the better of me. Now, more than ever, I know that with blogging your heart must be in it. More so, even if your heart is in it, you have to have time you can actually devote to it. Blogging may be my passion project, but it is a full-time job in and of itself, and if you’re overworked and stressed-out there’s just no way to keep it up-let alone produce meaningful content for your readers. Don’t get me started on promoting it properly… If you let that go on too long the burnout is harsh, and eventually you lose the love you hold for your favorite hobby/income source. Chances are, if you’be been blogging for as long as me (8+ years!) you’ve already experienced an unplanned blog break in one way or another. If you haven’t had an unplanned blog break yourself, you’ve seen bloggers you follow go through it-and possibly you’ve seen some never come back. I couldn’t imagine putting so much hard work into my blog just to get so burnt out I took a break that became permanent. I don’t think my heart could take it. So how can you help avoid taking an unplanned blog break that could turn into giving up blogging? Here are some ideas. This is my biggest problem-I take on too much. I’m forever taking on more than I can handle-though it’s typically because I’m really excited about the project at the time. I loved blogging here so much that I branched out and opened up several other blogs, a few on my own, and a few with friends. Then I took on managing Facebook groups, Instagram challenges, big group giveaways, reviews and sponsorship from multiple programs, and much much more. As it turns out, I can’t do it all. I’m really not Wonder Woman. Seriously, if you have too much on your plate it’s okay to turn down a sponsored post, giveaway invite, or other projects. Things like that will come around again, and it’s better to say “I’m sorry, I can’t do that at this time” than to promise something you can’t deliver and burn a bridge with that company/person forever. If you’re like me, and you find yourself with way too much on your plate-let some things go. Sit down and take stock of everything you have to do and all of the projects you’ve committed to and decide which ones you MUST keep and which ones you should probably let go of. It doesn’t have to be super detailed, but it needs to be clear to you what you’ve got on your plate and how to handle it. I recommend sitting down and making a list of all of the things you need/want to be doing and compare it with a list of all the things you’re actually doing, then adjust as needed. It’s definitely fine to let some things go in order to achieve more of what you want to be doing and reach your goals. If you’re starting to feel overwhelmed and stressed out with all you have to accomplish, get some help. If it’s your daily life, ask your partner/friend/family member to assist with a few things. If it’s your day job (assuming you have one aside from blogging) get a coworker to take on some responsibility for a while. If it’s blogging, there are a few things you can do to lighten your load. That’s right, there are lots of fantastic VAs out there looking for work, and while it may up your monetary expenses, it definitely lowers the expense your body/anxiety has to put out. I’m so grateful for my VA and her help completing some of the threads in my groups. If you’re struggling to find the time to write/create content, why not reach out to some of your favorite bloggers for help? Many bloggers would love the chance at a free guest post on a well-established blog, and in return for awesome content they’ll get credit and a shout out that will help their SEO and help your readers find them. If you’d like to take the guest posting to a new level-take on some contributes! I’m so grateful for my fantastic partners Kenzie and Beth on the two other blogs I co-manage (Our book blog Page à Vu and the blog swapping blog Chaotic Goddess Swaps). But, if you don’t want a full-on partner on your blog, take regular contributors and set up a signature that allows them credit for their posts. Want to know what that looks like? Take a peek at how Dana from The Wonder Forest has her blog set up for contributors. It’s so well done (but everything she does is) and a great example. If all else fails, and you still really need a break away from your blog, that’s okay. Seriously. Plan some time away and let your readers know. Remind them that you’ll be back and you’re not just disappearing, and that they can keep up with you somewhere else if they can. Typically, you may still update your Twitter/Facebook/Instagram/Snapchat while you’re not blogging, so it’s a great way to keep your readership base actively engaged and interested until you start posting again. Have you ever taken a blog break?